Serve this with sprouted brown rice and a side of greens…a little hot sauce and this meal is PERFECTION. In a large saucepan or skillet over medium-high heat, sauté the garlic and hot pepper in oil just until golden Add the tofu and continue to sauté until the tofu is browned on all sides, tossing often. Add the shoyu or Tamari sauce and the lemon juice. 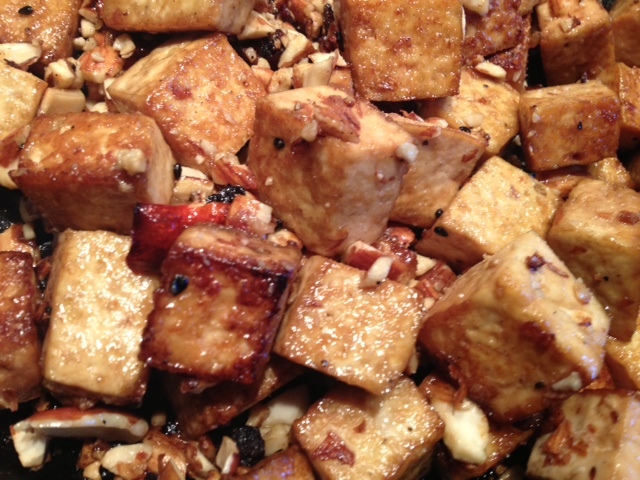 When the moisture is absorbed by the tofu, add the maple syrup and then the almonds. Continue to sauté until all of the liquid has cooked into the tofu. This entry was posted in nuts & seeds, tofu, tempeh, seitan and tagged almonds, animal free, dinner, lunch, sautéed tofu, save the planet, slow fast food, the best tofu, THE VEGAN LOVE PROJECT, tofu, VEGAN LOVE, vegan protein, vegan slow fast food. Bookmark the permalink.